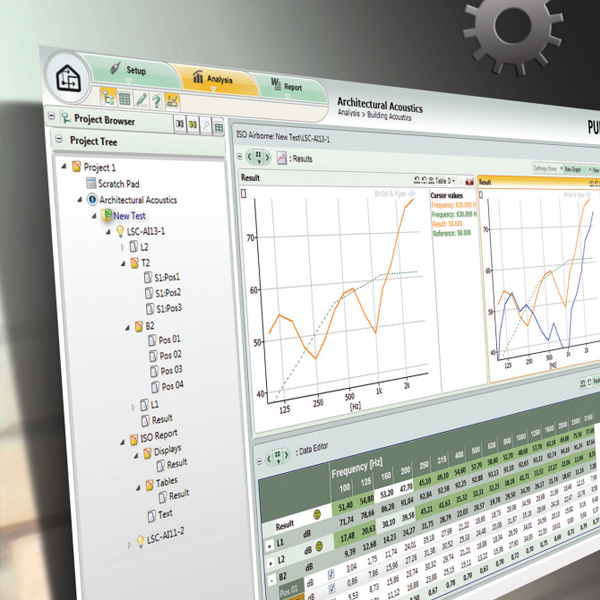 BK Connect Reflex Building Acoustics is the companion PC software for the Type 2250 and 2270 building acoustics measurement systems. Offering an intuitive environment for measurement analysis and report generation, BK Connect Reflex manages your building acoustics assessments in an easy and productive way. The BK Connect Reflex concept applied to our building acoustics solution enables you to review, compare, analyse and report your field and laboratory sound insulation results faster. Reports are published in a Word* document, Excel* spreadsheet or a PowerPoint* presentation, each of which operate within the BK Connect Reflex environment, updating measurement reports dynamically during the analysis process. BK Connect Reflex performs sound insulation data integrity checks that let you know if room measurement quality is below the minimum standard required by the relevant building acoustics regulations. A red smiley denotes a poor quality measurement and a yellow smiley indicates where attention may be required to ensure the best data available is used in the calculation. Determining the before-and-after performance of a rebuilt or repaired party wall is intuitively simple. Combine, compare and conclude Sound Insulation results with confidence and ease. Edit measurement data, both graphically and numerically, in the interactive display to instantly reveal which factors are contributing most to your sound insulation results. BK Connect Reflex speaks your language – and your client’s. Available in over 15 languages, BK Connect Reflex Building Acoustics can generate reports complying with the latest national and international legislation, thereby meeting local requirements and enhancing local understanding.